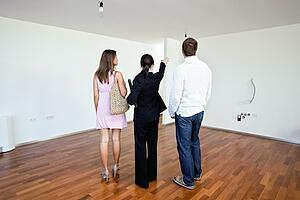 First-time renters are often reluctant to pay attention to details for fear of appearing picky or rude. Good management teams actually prefer that you speak up. The more thorough you are in the beginning, the less likely you are to have problems or disagreements in the future. Unless circumstances make it absolutely impossible, which is rare, you should always have a member of the management team accompany you on the walk-through. Two sets of eyes are better than one, and the staff member will be able to advise you on which conditions are repairable and which ones are acceptable. Most management teams will have a comprehensive checklist for you to document the condition of the apartment with copies for both of you. If you like, you may also want to take notes for your own use, either digitally with a tablet or old-school with paper and pen. With a camera as close as your phone, there's no excuse to miss the valuable step of taking pictures. Get a complete set showing each room as well as close-ups of any details, such as carpet stains or broken cabinets, that may be in question. If you and the management team member conclude that there are repairs to be made, agree on a specific completion date and note it in your records, which should then be signed by both of you. At Springs, your comfort and satisfaction are so important to us that we will release you from your lease for any reason within 30 days of move-in. Stop in today and learn more about the Springs Apartments Pledge from a friendly member of our on-site management team!